Sometimes on a farm you have to make hard decisions. This weekend we made a really hard decision. If you’ve been reading my posts, you know that Peepers had some leg problems. I didn’t discover them until it was too late to do anything about them (IF I had been able to do anything at all). We thought that she would be ok, because for a while she was able to get around on them fine, but as she grew larger, her body weight was too much for her legs. (if she was a girl – I still have no idea). The last several days she was also panting a lot, and I noticed that she was using her beak to help her move around, and she would also flap her wings trying to move around. One leg was splayed out almost completely behind her, with the foot on that leg also being misshapen – it was I think what they call “duckfoot.” She couldn’t put that foot down completely to push her body so that the other leg could help her move. 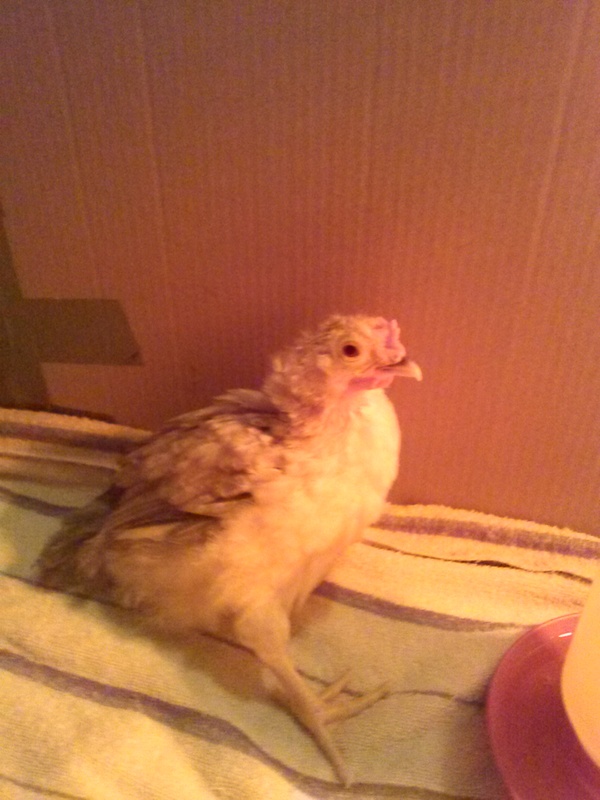 When we first got the other chicks, a couple weeks ago, seeing them running around made me realize just HOW disabled she was. I agonized over the best thing to do for her, and then we decided to just wait. We decided to not make a decision about her for the time being, because we thought she was enjoying her life. But for most of last week, we could tell she was just very frustrated, and possibly in pain. We tried thinking of other solutions – maybe housing her away from the other chickens later – since putting her with them would be cruel – they would just peck her to death because of her disability. We thought about keeping her in the house, but she would have had to have a chicken diaper; and probably be caged, to keep her safe from our dogs, and also because she really couldn’t move around anymore. I think that as she grew bigger it would just get worse and eventually she wouldn’t be able to move at all. We thought about giving her to other people, but like I said she’d end up being caged, and that is not the life I wanted for her. We decided on Saturday night that the nicest thing for her would be to humanely end her suffering. We did it as quickly and humanely as possible. And it was very hard to do, emotionally, because I’d bonded with her. As a farmer, (or budding farmer), I need to get over the emotional attachment thing. The case with Peepers, as opposed to my other chickens, was a lot different because she’d been alone for so long, and I had hand raised her. When I think of my other chickens (both the adults and the new chicks), there isn’t that bond there because they have each other. To me they are all just “the chickens,” they don’t have names, they aren’t pets. I didn’t mean to get that attached to her, but I did. I don’t know if the bond went both ways, but I was attached to her. I don’t raise my chickens specifically for meat, but at some point I’ll have to cull some for meat and/or to thin the herd, remove mean roosters, etc. I can’t get attached to them. I feel really bad but I think this was the best thing we could have done for her. She was a great little chicken. She got to live a comfortable life for her two months that she was here (or as comfortable as I could make it). She had a really cool personality. I am very sad that it had to end this way, but I think it was for the best. RIP Peepers. You will be missed. * And if you are wondering, no we did not eat her. Even if she had been big enough, we would not have. Previous Article Home grown edible mushrooms!